Chet Sutterlin is off on an epic adventure to climb to the summit of Mount Elbrus, the highest peak on continental Europe. Thanks to the cartographers of the 1890s, who deemed the Caucasus the North South divide between Europe Asia, Mount Elbrus is considered to be one of the infamous Seven Summits. 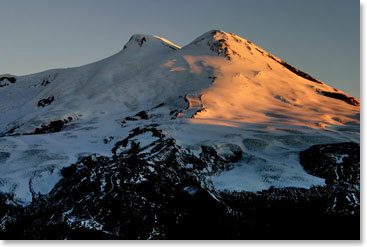 Standing at 18,510ft/5,642m, Elbrus is a glaciated peak with twin summits that soar majestically above their neighboring mountains of the Caucasus Range. Every trip to Russia is a true adventure taking us from the beautiful cultural centers of St. Petersburg and Moscow to the rugged peaks and simple life of the Caucasus region. Join Chet and the Berg Adventure Team as they attempt to make it to the summit of this incredible mountain.